Kids hoodies and sweaters come in a multitude of designs, color combinations, graphic art patterns, and styles, so it is very hard to choose from the wide assortment online that is offered by manufacturers. We have narrowed down the best of the top-rated and most-purchased items of this category for you. Hoodies are great for both boys and girls because of the simple design and the fashionable look they give. Consumers were overwhelmingly pleased with their purchases of these items online. Some of the best brands of clothing are on this list, such as Puma, Jerzees, and Hanes. Kids will love the well-known characters depicted on some of the fun hoodies, such as the Paw Patrol, Disney’s Cars, and Hello Kitty. Each item has its own appeal for kids of all ages with the different designs, colors, and styles. Here are the best kids’ hoodies and sweaters rated in 2019. 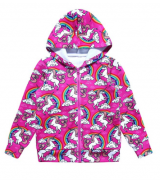 Children aged three- to thirteen-years-old will go crazy for this sweater that comes in plenty of variations of colorful and spectacular unicorn images. 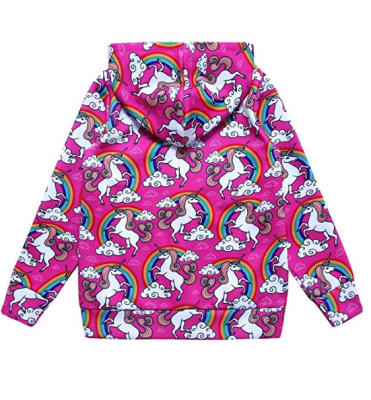 The gorgeous hoodie designs include a vintage unicorn, starry sky unicorn, unicorn fairy, and bowknot unicorn, among several others. The fabric is comfortable and silky elastic, plus it will not pill when washed and dried. It can be machine-washed and dried, but air-drying is best. This sweater includes high-resolution technology for the fantastic printing. The zippered hoodie will work for any occasion, especially in cooler climates, plus it can be used for casual dress or special events. Covering a wide range of children with the many sizes offered, your child will love wearing this garment all the time. When a hoodie has a favored design on it, kids have a hard time not wearing it quite often. For those who love unicorns, this sweater will be heaven to them! There are numerous choices for different unicorn patterns and color schemes that will definitely please every unicorn fan. Part of the comfort of this incredible hoodie is the splendid designs that kids can choose from. It is made of a lovely polyester and cotton blend that is elastic and silky to the touch. The technology used to print these designs on the sweaters is excellent. It is high-resolution giving the best vibrant colors in fascinating combinations and designs to excite and delight kids of several age groups. Made of 40% polyester and 60% cotton material, your child will be very warm and cozy in this hoodie designed in one of three Paw Patrol characters. They can pick from Ryder, Chase, or Marshall for their adorable hoodie in bright, vibrant colors. These are machine-washable and officially licensed by Nickelodeon, so there are no worries about pirated copies that are inferior. This hoodie is super soft, comfortable, and warm, even in the coolest climates. The best features, besides the wonderful colors and character designs, are the large zipper on the front with the nifty pull-tab and the zippered front pockets. It will be the younger set of kids that want to wear the Paw Patrol characters boldly. It is them after all that love to watch the show on TV and try to collect everything they find with the terrific personalities. If your child loves the Paw Patrol on Nickelodeon, then they will love this hoodie that comes in your choice of three of the main characters. The Paw Patrol is popular with both boys and girls, and this hoodie is suitable for both sexes. Kids love to have pockets for the many small treasures they usually like to carry with them. This hoodie will be great for that as it is very roomy and made with soft and warm materials too. These cute hoodies are not only colorful and warm, but they also are very well designed for fit and comfort. There is a huge zipper on the front and two big pockets with zippers on the front too. The Eddie Bauer Girls’ Sweater is offered in several various styles to suit many tastes and wardrobes and is machine-washable. Made of 40% acrylic and 60% cotton material the fabric is easy to care for. The sweater fits well and true-to-size states most of the positive reviews for this item. The remarks online also say that this sweater is very cozy and well-made. It was designed by Eddie Bauer who is the inventor of the first down jacket that was quilted. The famous designer creates fabulous sportswear designs of high-quality. This lovely sweater is perfect for school uniforms and casual wear, plus any special event that would require a simple, elegant sweater for girls. Especially for girls of school age, this is an elegant sweater that any little girl will love to wear. It can be saved for school, church, or just special occasions since it is so delicate and charming. This lovely sweater for girls will match uniforms perfectly for school and can be paired with everyday clothes for a wonderful look. It is dressy enough to worn for formal occasions as well. Sweaters are not usually easy to care for, but this one is because of its wonderful blend of materials. It is made of acrylic and cotton for a great feel and durability in washing and wearing it. Sporting a great design and high-quality construction and materials, this wonderful sweater for girls is a terrific value. It will last for several years of wear and for so many casual or formal occasions. Available in little boys’ and big boys’ sizes and several bold, neon colors, this Puma Big Cat Hoodie has the great Puma cat logo on the front. The color pattern of the logo matches the inside lining of the jacket for a spectacular look. The hoodie is made of 100% polyester and includes a warm kangaroo pocket on the front to keep little hands warm and toasty. This item is machine-washable and fleece-lined for the best warmth. It is a pull-on jacket that will conserve body heat and is easy to put on. 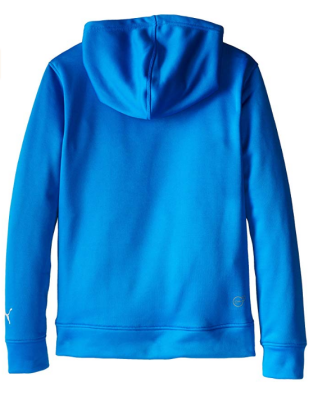 Even though this hoodie is for boys, little girls like to wear the Puma name brand as well. The style is great for casual wear or relaxed events. Almost all kid sizes are offered in this fabulous garment made for boys. PUMA is very popular among children, so they like to wear their favorite brand just as adults do too. Kids love to wear fashionable styles with great logos, and the Puma logo is one that is well-known and enjoyed for its quality products. This hoodie comes with the Puma cat on the front so there is no mistaking the genuine quality. Jackets that are fleece-lined are so much warmer than ones that are not. This one is and will be well-appreciated in the colder regions that have long winter weather and cooler days in the spring. Fleece-lined and warm, this amazing jacket for kids is one they will truly treasure. It has a large pocket in the front for both hands and is made of very warm materials to keep children warm in the cold. The hood on this Jerzees hoodie has a pull-on closure, plus the item is offered in several great, solid colors to interest many tastes. It is made of 50% cotton and 50% polyester material for the best comfort and durability. This hoodie is perfect for both boys and girls to wear and enjoy of many sizes and ages. It is machine-washable and resistant to pilling after washing as some sweaters and hoodie do. This item is offered in several great solid colors and has two front pouch pockets in addition to having a fully-zippered front. The Jerzees hoodie is a basic product that is great for everyday wear or casual events and occasions. The huge selection of sizes will accommodate plenty of children. Even in the same family, kids can choose various colors that will make them seem as completely different jackets. Front pockets on kids’ hoodies and jacket are hugely popular because they keep hands warm and can hold many small important things. This hoodie has two pouch pockets in the front next to the zipper in the middle. With a special blend of cotton and polyester, this hoodie is both warm and comfortably soft. It is also this mix of fibers that makes it easy to care for and clean, plus last for a long time to wear. The many colors and sizes of this incredible garment will please a wide audience of kids. Both girls and boys will flock to get one of these to wear because of the comfort and amazing style. This charming sweater for girls is cute and stylish and is offered in several pretty colors. It is wonderful for holidays and special occasions such as communions, weddings, church, and parties, as well as everyday wear. This sweater goes well with any school uniform and is lightweight but warm for all seasons. It is soft to the touch and will not shrink after washing. This item is made of cotton 59%, polyester 26%, spandex 15%. The manufacturer recommends hand-washing this item for the best durability and long-lasting wear. Girls of a wide age range can enjoy this delicate and adorable sweater for formal or casual wear. It is so soft and cozy that they will not want to go anywhere without it. This is an elegant everyday sweater that can be worn with a uniform to school or for casual wear. It is also perfect for formal gatherings and events because of its exquisite design. It has a fully buttoned up front that has adorable pearl buttons and ribbing on the bottom of the sweater and sleeve cuffs. This garment can be used for casual or dressy wear. Sweaters that will not shrink after washing are fabulous because this is a common problem with this particular garment type. This sweater will not shrink after washing because it is recommended that you hand-wash or use a wash bag if it is put in the machine. This hoodie is officially licensed by Disney and is offered in a bright red color with vibrant graphics. It is machine-washable and made of 40% polyester and 60% cotton material. The lining of the hood has the racecar flag design, plus the sleeves and front have printed logos on them. This hoodie is very soft, warm, and comfortable to wear and several sizes are available. If your child is a racecar fan or a Disney Cars enthusiast, they will love having this fantastic hoodie. It would make a wonderful gift for that special someone in your family. The fan base of Disney Cars will want this jacket to show their love for the movie and the characters. It is usually the younger set of boys and girls that are attracted to this show, and the sizes available reflect this. Fans of the Cars movie will go crazy over this colorful, unique hoodie! It is so cute because of the vibrant colors and well-made design that children will not want to take it off ever. The sleeve cuffs and hoodie waist are ribbed for flexibility and a snug fit. There is a full front zipper with a pull tab, so the jacket can be worn open or closed to hold in the most body heat. The full front zipper on this hoodie makes it easy to put on and take off, which is a huge plus for dressing kids. They can even dress themselves in this easy jacket, but they will want to keep on this adorable jacket always. It is a huge favorite with buyers. This fleece hoodie for girls is offered in a few gorgeous color choices and sizes to fit most ages of young ladies. It is made of 50% polyester and 50% cotton, so it is very warm, soft and comfortable because of these great fibers. This hoodie is fleece-lined and of medium-weight, plus it is machine-washable. Front roomy pouch pockets for storing small items and keeping small hands very warm and cozy are included. The sleeve cuffs and the hoodie waist are ribbed for a snug fit and flexibility and there is a fully fronted zipper with a handy pull tab for easy access. Girls can wear this plain hoodie almost anywhere, and even for special occasion events. Made just for girls, your child will have a good assortment of colors and sizes to pick from to obtain the best fit. The great solid colors will match wardrobes and outfits well. A hoodie that zips all the way down the front is better for some kids in case they get warm, but still want to wear the jacket. It can be zipped up all the way when it gets chilly too. Kids can enjoy the big pockets in the front and the fleece lining that will keep them so comfy and warm. Being ribbed at the waist and wrists keeps out the cold even better than a hoodie that is loose and open. Pockets on a hoodie are just as important as pockets in pants. Kids want to have places to put things they want to carry with them and these pockets in this hoodie are just perfect for that. This Hello Kitty three-piece set includes a zippered hoodie, short-sleeved t-shirt, and wonderful leggings all in the Hello Kitty design. The Hello Kitty logo is on the front and inside of the hoodie, on the front of the shirt, and all over the leggings. The set comes in girls’ sizes of toddler, baby girl, little girl, and big girl, plus many color variations are available. Each piece is made of 48% polyester and 52% cotton material for a look and feel that is fashionable, comfortable, soft, and warm. There is a fully-fronted zipper with a large pull-tab made in the shape and design of the Hello Kitty face. This set would make a fabulous gift for any special occasion, birthday, or holiday. Plenty of sizes are available for this three-piece set for toddlers, little kids, and big kids. Each one of those categories of sizes has individual sizes so you can get a perfect fit for your child. Hello Kitty is so popular with girls of all ages and sizes that it would be very hard to find a child that would not appreciate this lovely hoodie set with the well-known image on each piece. The set is well-matched and adorable. This has to be one of the softest hoodies on the market with the terrific combination of cotton and polyester. It is soft, warm, and cozy to wear almost anytime you need some heat retention. You get three incredible pieces in this lovely Hello Kitty set to satisfy any fan of this adorable character. It is perfect for a gift for that special someone with its wonderful feel and durable materials. For girls, The Children’s Place offers this charming sweater in a few color choices and several sizes. It is perfect for school uniforms, casual wear, and formal wear and can be machine washed. For the best durability, it is recommended to hand-wash or wash in a wash bag in the machine. This will prevent thread snags and tearing of the threads. Air-drying is ideal to prevent stretching. It has a rib-knit trim on the sweater waist and on the sleeve cuffs for flexibility and a snug comfortable fit. The sleeves are fully fashioned, so they move easily, and the sweater buttons down the front for easy dressing. The various size offerings should cover most ages of girls because they are listed as little girls and big girls. 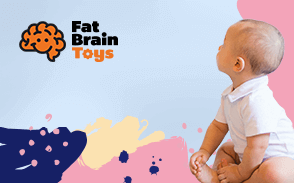 These categories each have individual sizes to get the perfect fit for your child. This is a simple, elegant sweater for girls that can be worn in many situations. It will go well with a school uniform or can be used for everyday wear. For special occasions and events, it will be just as suitable. This fabulous sweater is made of 100% cotton, so it is very warm, soft, and long-lasting. Children should get several years of use from the one they purchase to wear to school or formal occasions. Simple and stylish, this will be a favorite of your little girl. Although it is best saved for school outfits, it can be matched splendidly with other wardrobe items for dressy or casual events. These sweaters and hoodies are all in children’s sizes and are made with the images, colors, and designs that appeal to them most. The sizes are in the categories of a toddler, little kid, and big kid for most of the products. These items are simple and easy to put on and take off for those kids that are just learning how to dress themselves or have been doing it for a while. The zipper pulls are big and easy to handle for their small hands, and the buttons on the sweaters are easy to manipulate as well. Each product has its own place in a child’s life, for example, the trendy buttoned sweaters are perfect for school uniforms and special events. They can also be used for everyday wear as well. They are very versatile because of the simple design and plain colors. Some of the hoodies will appeal to children because of the well-known characters that are on them, such as the Disney Cars, Paw Patrol personalities, Hello Kitty, and the Puma cat. A few of the hoodies, like the rainbow unicorns and the galaxy fleece, are wild color combinations that are outstandingly bold and bursting with hues. Both boys and girls will love both of these designs because of the gorgeous graphics. To protect kids from the cold weather it is best to clothe them in the warm materials of these listed products. They offer the best comfort from the soft polyester and cotton and will be wanted by children for the interesting designs. The comfort for a sweater or hoodie comes in the form of it being able to retain the body heat of the person and to also be soft to the touch. All of these featured items have those qualities to be very comfortable for kids to wear indoors and outdoors. Hoodies are very warm, especially the ones that are lined with fleece. Some of them zip up the front while others are slip-on over the head types. The sweaters that are featured here zip up the front or are the buttoned type that is perfect for school uniforms and special occasions. Each item featured is a best-rated item in online sales that received the best reviews and the most positive feedback from buyers. They would definitely purchase these items again for their children. We highlight only the best products of a category to save you time in your shopping experience. You quickly know which items are constantly pleasing other shoppers with our concise information about each item. These jackets are so versatile in where they can be worn because of the gorgeous designs that some of them sport. Every garment listed is great for casual everyday wear and will be suitable for most daily outfits. Warmth is a major concern for a sweater or hoodie, and these are all very warm, soft, comfortable, and durable. A hoodie is made mostly of polyester and cotton and has the same feel as sweatpants or sweatshirt material. These jackets all have a hood that is attached to the neck of the garment. It is either closed with a pull string or left open on the head. The hood is not detachable and when not in use just folds back on the shoulders of the piece. A sweater does not have a hood attached to it, and the fibers of the garment are more of an open weave that is breathable and softer. They usually button or zip up in the front and are more for school uniforms and special occasion wear. Most of these sweaters and hoodies say they can be machine washed and dried, but for the best care and durability, hand-washing and air drying are recommended. The sweaters especially need this care to prevent them from shrinking and having threads damaged in the machines. The hoodies are more durable than the sweater when washing. Because they are made of tough and strong materials with fabulous stitching, these garments will last a long time even with rough use from children. All of these hoodies and sweaters are made of soft warm materials such as polyester and cotton, so kids will be the warmest when they wear them. The fabrics are comfortable and cozy, as well as durable and long-lasting. Children should get several years of use from each one of these offerings. Some of the hoodies get softer with each washing making them more comfortable the longer they are worn. it is the materials and the style of the garment that decide the purpose or place that it is best worn. the more delicate or refined style will be best for formal or dressy events, while the others are casual or plain for school uniforms. q: What age group is best suited for these items? The best age groups largely depend on the type of individual item, but a general answer would be ages three- to twelve-years-old for most of the featured products. q: Are any of these products specifically for boys or girls? Yes, a few of them are specific in the models of the items. The ones for girls are the Eddie Bauer Sweater, Smiling Pinker Girls’ Cardigan, Hanes Big Girl Fleece Hoodie, and the Children’s Place Cardigan Sweater. For the boys, we feature the Paw Patrol Hoodie, Puma Hoodie, Disney Cars Hoodie, French Toast Boys’ Cardigan, and the Galaxy Fleece Hoodie. The remaining items are for both boys and girls. q: Which hoodies and sweaters are the easiest for kids to dress themselves in? The easiest hoodies and sweaters for small kids to get on and off by themselves are the ones that zip up the front or button up the front. These are also beneficial when the child becomes warm and does not want to take the garment off. They can just unbutton or unzip the front to get some ventilation. q: Which of these products would be best for a gift or present for the holidays or a birthday? Plenty of these items would make great gifts for one reason or another. The lovely sweaters would be great to give a child that is just beginning a new semester at school, and the hoodies with character graphics would be wonderful for those children that like those particular personalities and movies. This greatly depends on the individual child and what they would like best for a new sweater or hoodie. q: Which sweater for girls are suitable for school uniforms? The best girls’ sweaters for school uniforms are the Eddie Bauer, Smiling Pinker, and the Children’s Place Cardigan. For boys’ uniforms, the French Toast V-Neck sweater would be a nice choice for school. q: Will these items shrink if washed and dried in the machine? If it fits too big, would this be a good idea to shrink it? The sweaters may shrink in the machines, especially in the dryer. If you want it to shrink, then wash the item in cold water and dry it in the machine. It will shrink this way but be careful that it does not shrink too much. With just machine washing and air drying, there should not be a problem with shrinking.